Researchers at the University of Pennsylvania have created the world's first placenta-on-a-chip, a model of the interface between mother and fetus that will be used to identify causes and preventive measures for preterm birth. The device, no bigger than a flash drive, is the latest innovation involving bioengineered organs-on-chips. Others have been developed for research on the lungs, eyes and intestines, but this one holds added significance because the placenta is widely considered the least understood human organ. With the placenta-on-a-chip, researchers will be able to model the transport of nutrients across the placental barrier using two layers of human cells. 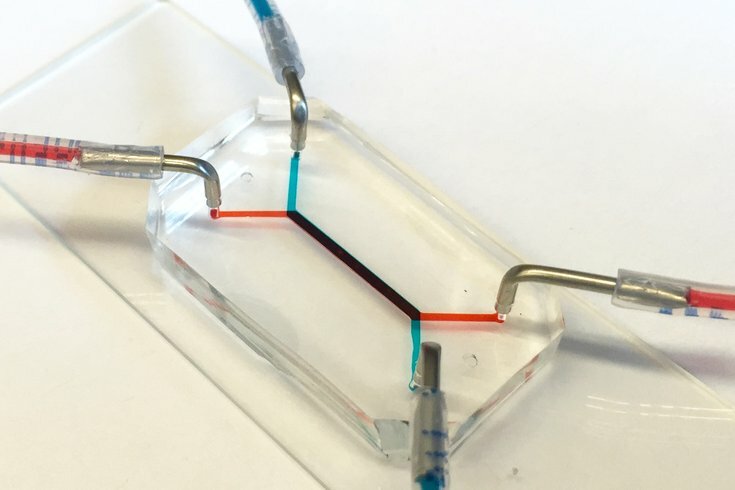 The clear silicone device has two parallel microfluidic channels that are separated by a porous membrane comprised of interface cells from the mother and fetus on either side. Together, layers of these cell types simulate the function of the placental barrier, which regulates blood flow between the maternal and fetal circulatory systems. The placenta-on-a-chip is still in its early stages, but it represents a progression in Huh's prior discoveries at Seoul National University. Researchers can now simulate the gradual thinning of the placental barrier that occurs during the course of pregnancy and further study the tissue that forms as a result of a fusion between fetal and maternal cells. Studies using the new device will be supported by a $10 million grant from the March of Dimes, which funded the establishment of the Prematurity Research Center at Penn and four other universities in the United States. Huh's team plans to share the technology with the four other March of Dimes sites as they continue tests that will expand its capabilities. Eventually, Huh envisions using it to demonstrate the potential of organ-on-a-chip technology for basic and translational research in reproductive biology and medicine.